This won’t make the mainstream media because it contradicts their rants and raves about doom and gloom climate change. Anthony Watts has been having a bit of fun poking the borax at global-warming alarmists at where they take their temperature readings from. His site Watts Up With That is the most visited climate change site on the web. Visit and be informed regarding the bogus claims and outrageous hoaxes the likes of James Hansen, Al Gore, Michael Mann ad nausem make and see them systematically debunked for the outright lies that they are guilty of. These people are not as smart as they make out, rather, they are rather dumb. Anyone remotely interested in the so-called Global Warming crisis knows who Dr James Hansen is. He is the wizz bang kid who tried to convince us since the 1970s that global temperatures are a thing to be worried about. He has had three goes at trying to push his ideas as being credible. He even convinced failed US Presidential candidate Al Gore that his data was factual to which Al responded with the movie “An Inconvenient Truth” which has been force-fed to gullible little school children ever since. Problem is each time Hansen produced his evidence someone of high acclaim has produced the counter evidence to repudiate it. 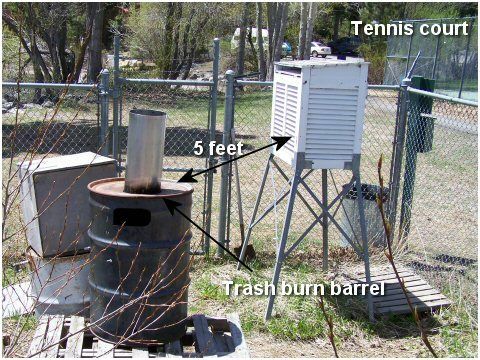 The following link is to the chart that shows right up to May 2012 what the temperatures are really doing. NB: be careful to notice the curved median line running through the middle, for while it may be true to have the occasion where one or two years are higher it is also noteworthy to see the years when it is cooler. 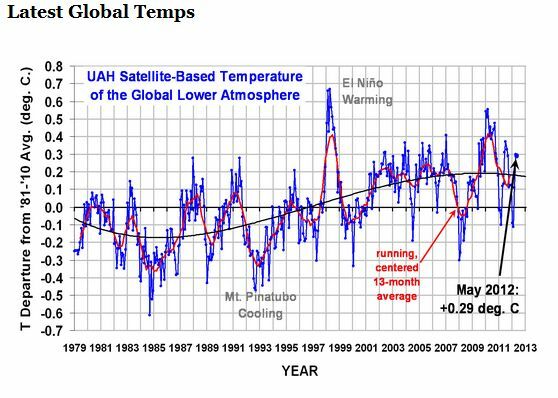 Also note how events such as Mt Pinatubo and El Nino have a dramatic effect on temperatures which such temperatures are effected not by man’s puny input but natural events. The trend is obvious to the truth seeker but of course the Hansen slanted eye will never believe it even if an ice age were to suddenly form.